Today at The Comics Journal, we're pleased to share the opening salvo from Marc Singer's recent release with The University of Texas Press. If you like what you see--or you don't, either response is fine in a click-based economy--make sure you're here tomorrow for Marc's interview with us on the project. My aim is not to belabor this or that point in an online dustup over a comic book, nor to choose sides between Wilson and Lepore. Instead I want to highlight the telling divergences between their critical approaches, but also the surprising convergences—for the only thing that was at all strange about this exchange, which followed well-worn formulas for criti­cal discussions of popular culture, was that both parties held one principal but unspoken assumption. Lepore’s review is indicative of the approach taken by many academics who are unfamiliar with comics: she doesn’t engage with the actual comic in any detail, doesn’t place it in the contexts of its publication or its genre, and doesn’t seem to think it merits any more sustained critical argument. Wilson’s response is equally indicative of the approach taken not only by fans and creators but by many academics who identify as fans and who are intimately familiar with the world of comics: defensive, anti-intellectual, and adamant that good criticism should be aspirational, Wilson also exempts comics from sustained critical argument if that argument should prove too unsympathetic. What one rules out in her offhand dismissal, the other rejects in favor of populist resentment. Neither approach is adequate to interpreting even the most mundane comics, particularly in an academic context. This book attempts to chart another course, showing how comics studies can benefit from more care­ful engagement with comics texts and their many material, historical, and cultural contexts. Extending this debate to the academic study of comics requires an important caveat. It’s one thing to criticize Harvard scholar Jill Lepore for her breezy indifference, even when she’s writing for a popular magazine, but G. Willow Wilson is not an academic. This doesn’t indemnify her from criticism either, but it complicates any attempt to cast her comments as representative of the populist tendency in comics studies. However, many academics who work in comics studies share the same assumptions and make the same arguments, including the celebration of unreflective reading and the suspicion of academic scholarship. Sometimes they even take the opportunity to prescribe these values for the field as a whole. Today's review comes to us via Leonard Pierce--and it's of James Sturm's Off Season. He's into it, friend. Did the election split open new wounds in our psyches, or did it just expose the damage that was already there? That’s the question that shades every panel of James Sturm’s moving, disturbing, magnificent new graphic novel, Off Season. Politics doesn’t intrude in the narrative in any obvious or arbitrary way; it simply crowds into the lives of its characters in the same ways, big and little, that it does to us all. Off Season isn’t a book with a political axe to grind, in which ideology stands in for our personal problems; it’s a book that illustrates how politics is inextricable from our emotional lives, and functions as both an influence on and a reflection of our interior lives. Over in Florida, a state I am flying directly towards, probably at the exact moment you are reading this, ReedPOP has continued its expansion: they took over the Florida Supercon. ReedPOP is the part of Reed Exhibition that handles a bunch of geek culture conventions, some of which have healthy comics components. I don't go to any of these shows, and i've worked professionally in comics longer than many of them have existed. It gives me great pleasure to ignore them on a near permanent basis. One thing you shouldn't ignore is the Comics Journal Newsletter: the new one came out today. If you're a daily reader, well God bless you, but if you're not, the weekly Newsletter is the best way to keep up with what's happening here. Today on the site, we have a report from the new Naoki Urasawa exhibit in Los Angeles. The Japan House gallery is accessed through its storefront, which is filled with a range of tastefully made, lovingly displayed Japanese housewares, decorations, and books. “This is MANGA!” features some elaborate installations, such as a “tent” of banners bearing series of striking Urasawa panels, as well as a map showing where he’s been published throughout the world. There’s a mannequin wearing the costume of “Friend,” the cult leader villain of 20th Century Boys, from the Japanese movie trilogy adaptation of the comic. A table out front has laminated recreations of notebooks Urasawa kept when he was young, which show off his early artistic progression. But the show’s main element is a series of three-sided displays throughout the gallery, each of which is dedicated to a specific Urasawa series. With manga-style arrows helpfully telling visitors where to start and how to read, each side follows the process by which a manga page goes from concept to completion. This is illustrated via original art from Urasawa, with a wealth of nēmu (storyboards) provided for the show. There are around 400 pieces of such art in the exhibition, giving patrons a detailed look at the nuances of comic art, and helping laypeople understand how things like layout and framing play into one’s understanding of a scene. Nathan Chazan is here, too, with a review of Michel Fiffe's licensed GI Joe comic. Blessed with the opportunity to tell his own stories at whatever pace he wants, Fiffe reanimates the cliches and visual licks of the comics that clog the quarter bins (and our hearts). Whether in the '80s superhero analogizing COPRA or the continuity calculus of Bloodstrike: Brutalists, Fiffe’s artistic exuberance doesn’t just make good comics, it makes for comics that make you want to read comics. With GI Joe: Sierra Muerte, Fiffe continues his foray into personalized expansions of the quarter stack with an official tie-in comic from IDW, the patron saint publisher of glossy new toy commercials. Unlike previous works in this vein from Fiffe, there are some serious constraints on what he can do in this book. COPRA had the benefit of being an original story, albeit one populated by familiar faces with serial numbers filed off, and even Bloodstrike was continuing a narrative that honestly few people remained attached to (at least not moreso than Fiffe). GI Joe is not the media force it was in the mid-'80s, but it still is one, and Fiffe has both fan and publisher expectations to bear in mind on this title. There are genuine external constraints on this book - he can’t push the formula too far. And besides which, Fiffe is a diligent fan himself in many respects, and the house style of GI Joe is not quite as outlandish as some of the material he’s riffed on in the past. As such, there is something of a ceiling on the excitement of this comic that I haven’t really felt before in his comics. The storyline is captivating, but a little boilerplate, and the parade of characters tossed by the reader in issue one are entertaining but it’s hard to have much attachment to them without the excitement of prior familiarity. Even the visual flair seems a little tampered down in comparison to other Fiffe books, although still wildly experimental in comparison to anything else on the Wednesday racks. —Interviews & Profiles. At Smash Pages, Alex Dueben interviews Cathy G. Johnson about her new YA comic, her work as a teacher, and her podcast, among other things. Drawing a Dialogue is a comics scholarship podcast that I do with my friend and peer e jackson, and it’s about putting comics into historical and educational contexts. So we’ll take a topic that pertains to comics, such as transgender identity or autism, and then we will share academic research with our listeners to broaden our collective understanding of comics. My segment of the podcast is particularly about education. I am part of the equity and inclusion committee at the school I work for now, and it’s something that we talk about a lot, that people’s knowledge about subjects limits us and can gatekeep others. This is also true in publishing and the art world. So our effort with the podcast is to take knowledge out of the ivory tower and change the conversation around comic books, to hopefully create a more equitable future. The New Yorker has an ultra-brief interview with Jaime Hernandez. Nadja Sayej at The Guardian has a brief profile of Robert Crumb to go along with his current exhibit at the David Zwirner Gallery in New York, images of which have been posted over at The Paris Review's site. —Reviews & Commentary. I usually try to avoid spending much time covering superhero movies, but because this is an issue that also bleeds into comics, I thought I'd link to two recent articles on complaints that Captain Marvel demonstrates a too-cozy relationship between Marvel and the United States military. Behind the language of representation and inclusion, some critics see evidence of a problematic relationship between Captain Marvel and the Air Force, which had an active role in the film’s production, received numerous plugs throughout its promotion, and assisted in publicizing the movie. The film comes at a time when the Air Force faces a severe shortage of pilots (especially women), a recent “readiness” crisis due to its fleet of aging aircrafts, and a worsening epidemic of sexual misconduct. Even with all this baggage, the Air Force plans on expanding back to Cold War-levels, making public opinion more important than ever. Derik Badman writes about a recent Sam Glanzman collection. [The] first issue is just totally crazy. The Admiral of the submarine has this long vision of the destruction of New York City due to the effect of what “the Enemy” has done in the Mariana Trench to cause sea levels to rise. In a most unusual move, throughout all four of these issues the antagonist is always just referred to as “the Enemy”, never seen, never named, never explained in the even the slightest way (are they aliens? is it a they or a single individual? why do they keep trying to destroy the world via created natural disasters?). I do notice on rereading a panel that shows a mysterious looking clawed glove crumbling a map of the United States, but the sketchy panel borders on that image make it read like another vision not a glimpse of the actual Enemy (oddly, it reminds me of the gloved antagonist in the Inspector Gadget cartoon). —Misc. Eli Vally and Meghan McCain had an interesting exchange on Twitter last week. Monster Brains has a great gallery of Gahan Wilson cartoons up right now. Today at The Comics Journal, we're pleased to share Oliver Ristau's take on an exhibition of Émilie Plateau and Jul Gordon's work, which is taking place until March 23rd in Bremen, Germany. Serving as a model was also a point brought up while I was talking to dessinatrices Émilie Plateau from France and Germany's Jul Gordon during an exhibition of their creative work, which wasn't limited to the showing of drawings alone. 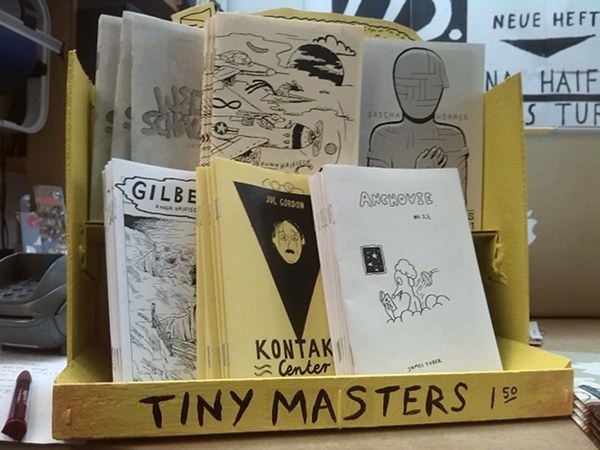 After years of publishing fanzines – Gordon with the Tiny Masters bunch consisting of the likes of Anna Haifisch or G.W. Duncanson, Plateau with the collective Nos Restesfounded by Belgium's conscientious objector to mainstream comics Jérôme Puigros-Puigener – both now share first-time releases of their comics in hardback editions. You can read this as another manifestation in terms of reification by emerging from the world of self-made zines and their fleeting nature. And here we are at Day Five of Jesse Reklaw's Cartoonist Diary, where things get meta, and he reads...Cartoonist Diaries, here at TCJ? I did not see that coming. Today's review comes to us from Tegan O'Neil--she's fallen pretty hard for Julie Delporte's This Women's Work. I’ve always loved books assembled from artist’s sketchbooks: there’s no more exciting version of comics to me than something small and intricate made by hand and reproduced in such a way as to not merely preserve but to lionize the format’s material limitations. It’s hard to forget that we are supposed to be reading someone’s personal narrative when the story comes in the form of a personal scrapbook or illustrated notebook. A few years back I noticed that more and more books I was receiving from women artists seemed to be going for a raw and studiously rough presentation in terms of medium and execution - specifically, directly reproduced colored pencils seemed to be multiplying. Eventually I came to see the move - a widespread gesture with clear roots in Lynda Berry’s nonfiction comics, among many others - as a studied turn away from the hyperfocus and discipline of the masculine-coded industrial precision of turn-of-the-millennium comics auteurs, to say nothing of the pervasive slickness of most computer-based commercial art in 2019. There’s room to breathe here. Negative space isn’t bound by tight panel grids. She mentions Louise Bourgeois at a couple points throughout the narrative, and you can actually see the influence, with swaths of minimal, almost primary color set as stark central design motifs at various points. In the streamlining services department, Image has shut down a subscription service called Image Direct. Based off the laziest form or research--looking at the reactions in the two places that acknowledged this news initially, which was Bleeding Cool and reddit, it doesn't seem like this was a very well-used service that Image offered, and should not be used as proof of any one particular argument or theory about the future of the direct market. Unless you really want to, of course. Heidi MacDonald watched Fox & Friends so that you don't have to, and she's got the tapes to prove it. Ben Marra's team up with Joe Casey--six years in the making, you're welcome--featuring our Lord and Savior in full hyperviolent regalia was the current topic du jour on that television show. Please to enjoy! Kim Jooha returns today with a look at the work of Stefanie Leinhos, which Jooha considers to be a kind of "conceptual comics" akin to conceptual art. The drawings … were made directly on the zinc plates and only existed for the time being of the printing process itself. The plates were washed out afterwards and handed over to the next user. Say Goodbye to the original drawing and Hello to the original print! The original is destroyed, and the reproduced becomes (the nearest to) the original. In The Long Goodbye, Leinhos literally erases the privilege of the original. And we have day four of Jesse Reklaw's week contributing our Cartoonist's Diary. —News. Wiley Miller has issued an apology for the anti-Trump message found in a recent strip, which led to a number of newspapers cancelling Non Sequitur. Remorse is an understatement. I'm gutted by my own poor judgment. "Non Sequitur" has been my pride and joy, as well as livelihood, in a cartooning career that has spanned 42 years. The strip has been in print 27 years, and garnered many awards. During that time, I've drawn just shy of 10,000 strips, and not a single one contained such a vulgar, foolish, unprofessional "venting." CRNI has written a letter to the Supreme Court of California defending Ted Rall in his recent case against the Los Angeles Times. —Interviews. I missed this recent interview with Yoshiharu Tsuge at Zoom Japan. Starting in 2019, your work will be translated into both French and English. It was quite a long wait, though. T. Y.: You wonder why it took so long?… It’s hard to explain… For a long time I tried to escape other people’s attention. I’ve never liked to be put under the spotlight. I only wanted to lead a quiet life. In Japan we say ite inai, which means living on the margins, not really being engaged with society, trying to be almost invisible if you like. Today at The Comics Journal, we've got another go round with Josh Kramer--today, he's speaking to James Sturm about all the various life experiences that ended up getting poured into the creation funnel on the way towards the creation of Off Season, his most recent graphic novel with Drawn & Quarterly. This is kind of a different mode for you to work in. So many of your books are set in the past, in America or Eastern Europe. How did it feel to be working in a contemporary setting? I liked it. I liked that it reengaged me to my surroundings. That car that Mark drove, I’ve sold it since then, but it was my car at the time. That house that he’s doing construction on is basically my house. The snowstorm, the streets, those are all Upper Valley. The tire place, etc. I really enjoyed that. I remember, within a week or two of the election, talking to the cartoonist Summer Pierre and both of us expressing a visceral need to just draw things in front of us. That was that big question after the election: why weren’t we paying attention? And it was my big question, after being conned. This need to just kinda ground yourself, as opposed to all the online stuff, and even doing historial stuff, you are pulling resources offline and looking in archives. For another taste of contemporary life, we've got Jesse Reklaw with the second day of his Cartoonist Diary. Today, he's using one artform to describe another! My apologies for today's late and abrupt blog entry. It's my daughter's sixth birthday, and we have brownie sundaes to eat. After departing Dynamite, RoboCop found his next home at Boom!, which adopted an approach similar to Avatar’s, bringing in Steven Grant to adapt Frank Miller’s unused screenplay for the third RoboCop film, this time with artist Korkut Öztekin. The result, the RoboCop: Last Stand mini-series (2013), is a diminished work, even by the measure of Frank Miller’s RoboCop (Avatar). Whereas Miller’s original screenplay for RoboCop 2 managed to approximate RoboCop’s post-human manneredness, the Miller script Grant uses for Last Stand gives the character stock noir dialogue. The story’s take on a corroded Detroit is also more perfunctory; when readers see a commercial for something like the forced reprogramming of rude children, it has a direct link to Last Stand’s larger plot. The work here resembles The Spirit (2008), a film in which unchecked Millerisms smother the identity of its source text. Last Stand begins with RoboCop in hiding, framed for a series of murders but committed to protecting Detroit’s most vulnerable. The city’s police force has collapsed, and RoboCop is effectively at war with OCP, aided by a rogue engineer and RoboCop super-fan named Marie Lacasse. Battles rage within OCP as well, allowing Faxx, a scheming researcher, to rise to the top. Faxx, whose work involves “molding [a person’s] existing personality to a more socially acceptable matrix,” is a character nearly identical to Margaret Love of Frank Miller’s RoboCop, down to Last Stand’s irony-free attempts at titillation. These resemblances occur often throughout the series; it’s a wonder Boom! had any confidence Last Stand might stand on its own. The comics read not just like an echo of the film RoboCop 3 or Grant’s Miller adaptation at Avatar but also of Miller’s other works. Jesse Reklaw is here, too, with the second day of his Cartoonist's Diary. And Josh Kramer has a review of Lucy Knisley's pregnancy memoir, Kid Gloves. Before I get into reviewing Lucy Knisley’s new book, Kid Gloves: Nine Months of Careful Chaos, I need to own up to something. Until giving Kid Gloves a serious read, I thought of Knisley solely as a memoirist. Her five autobiographical graphic novels recall the mostly charmed twenties of a middle class American white woman. Knisley has long acknowledged her privilege. "I am lucky. I am aware of that," she writes in 2014’s An Age of License. "Yes, I make work about food and art & travel BUT THERE IS MEANING IN IT if to no one else but me." And clearly others have found meaning in her work as well. Knisley is an award-winning and New York Times best-selling author. She attended both the School of the Art Institute and The Center for Cartoon Studies. [I did also but we did not cross paths.] Six books by age 34 is no small accomplishment. But here’s the thing — I was wrong about her. —News. This weekend brought the announcement of one of our greatest living cartoonists, Gahan Wilson, is suffering from dementia, and in need of help with funds for medical care. His stepson has set up a GoFundMe site here. Gahan and my mother had been residing in an assisted living facility in Arizona. With my mother's passing, the facility is about to discharge him. We must find him a memory care facility immediately. —Interviews & Profiles. The most recent guest on RiYL is Mimi Pond, and the most recent guest on Virtual Memories is James Sturm. Today at The Comics Journal, we're starting up another Cartoonist Diary--this time, it's with Jesse Reklaw. His week starts off with Tai Chi! I'm already at superfan level. The experience may have slowed Miller’s cinematic rise, but it did not mean a break with the RoboCop character. Before the release of the third film, Miller scripted perhaps RoboCop’s best-known comics appearance, the RoboCop Versus the Terminator mini-series (Dark Horse, 1992). At this stage, Miller maintained much of his deftness as a comics writer. He neatly combined the two franchises through the premise that RoboCop’s merger of human and machine supplied the self-awareness necessary for the eventual robot takeover of the Terminator films. (At first, the story’s Terminator machines seek not to destroy RoboCop but to defend him from a time-traveling revolutionary.) Miller also writes for his artist, Walter Simonson, a heavy hitter in his own right. Our review for the day is of the first volume of Mob Psycho 100, courtesy of Tom Shapira. He's on the fence, but leaning pleased. ONE’s other major effort is Mob Psycho 100, which ran from 2012 to 2017 and is just now being published in English translation. Looking at the surface it would be easy to criticize Mob Psyco 100 as derivative of the author’s previous work; the focus of the first volume is on ghosts and psychic powers instead of superheroes but otherwise much is the same: like Saitama the protagonist of the story, Shigeo Kageyama AKA Mob (as in ‘one of the mob,’ not a gangster) is overtly powerful in a way that allows him to end any conflict easily; like Saitama his biggest issue is his passivity which allows the danger to flourish until he finally arrives to deal with it; just as in One Punch Man there is a con-man who uses the hero’s powers to advance his social statue. Both series seem to exist as an inversion of popular shonentropes – in series such as Dragonball, Bleach and Naruto the hero must become stronger through a series of fights, life as endless struggle that demands constants self-improvement. Both One Punch Man and Mob Psycho 100 start with hero already the strongest one there is and work from there. Yet despite these similarities it would be wrong to brush aside Mob Psycho 100 as a case of second album syndrome. First, because even if it operates within the same perimeters they are narrow enough to make it feel unique compared to other works; second, because we often allow beloved creators to offer a corpus of work that is undeniably of similar bent; and third, because Mob Psycho 100 is just good; which probably trumps all other arguments. Big day on TCJ today. First, we have Alex Dueben's interview with Silver Age cartoonist Joe Giella. You mentioned talking with Whit Ellsworth. Over the years did you have a lot of interaction with writers? No, absolutely not. My relationship in comics was with the editor. I worked with Julie Schwartz for 45 years. He was a tough guy to work with but he was fair. We became very good friends right to the end. He was a tough editor. You tell him you’re going to deliver and if you didn’t deliver, you were finished. One time he said he could set his clock on me because I was never late. The one time I knew I was going to be late was when my dad passed away, but I alerted Julie and Julie understood. So you would work more with Julie Schwartz and Mort Weisinger than the writers. Oh god, Mort Weisinger. [laughs] He may have been a very talented writer but it was not easy working with Mort Weisinger. I quit the Batman strip twice after he offered it to me. For Mort it was a feather in his cap if he could go to DC and say, I got Joe to do the strip for only X amount of dollars. I would have been making less than I did in the comics – and I had to do carpentry work to make a living at the time. At that time doing a syndicated strip was the pinnacle for an artist. I really wanted to do it, but not on his terms. The other person people ask me about is Carmine. He’s the one I collaborated with on The Flash and a few other characters. Carmine was an excellent – and underline excellent – layout man. His style was to draw this way and his concentration was on the layouts. That’s what he excelled at. Glynnis Fawkes is here with the fifth and final day of her tenure creating our Cartoonist's Diary. And finally, we also have a Tegan O'Neil's review of Corto Maltese: Secret Rose. The Secret Rose should probably not be anyone’s first exposure to Hugo Pratt. This is later Pratt at his most esoteric, clogged to the arteries with ambiguous literary references masquerading as pointedly elliptical conversation. A gripping mens’ adventure yarn in the mood of Caniff? Certainly not! A trip to visit Herman Hesse in the Swiss countryside of 1924, that sounds more the ticket. At times, this album seems to live down to certain stereotypes held in English-speaking precincts regarding Eurocomics conventions - behold a tough guy stereotype from American adventure stories, your cowboy or your back robber or sea captain, sipping his drink at the bar before slipping out with the shadows to desultorily sock some local toughs on the jaw. But first he’s got some wry comments to make about Malraux, and doesn’t that woman have large breasts in the most literary way? —News. DragonCon co-founder Ed Kramer has been jailed again, after being arrested for allegedly taking photographs of a young boy at a doctor's office. Kramer pleaded guilty to three counts of child molestation in 2013 and was sentenced to an aggregate of 20 years, with the first five to be served in home confinement. He is no longer on house arrest, but still wears an ankle monitor. On his Facebook page, cartoonist Milton Knight has reported being the victim of a hate crime. The cops came. I went to the hospital. Cuts, a broken nose and more. He went to the same hospital; he had busted a fist!! I pressed charges; he went to jail for battery. —Reviews & Commentary. Brian Nicholson writes about Segar's Popeye. While other masterpieces of the first half of the twentieth century comics page, like George Herriman’s Krazy Kat or Winsor McKay’s Little Nemo are definitely acquired tastes, Popeye was not only popular enough to make its creator a rich man back in the day, it remains functional as populist entertainment today. I feel pretty “what’s not to like?” about it, and would recommend it to whoever. It’s funny, the characters are good, there’s adventures. The humor is three quarters sitcom style character work and one quarter the sort of silliness that verges on absurdism.